Coast & Country - What is an avocado cuke? 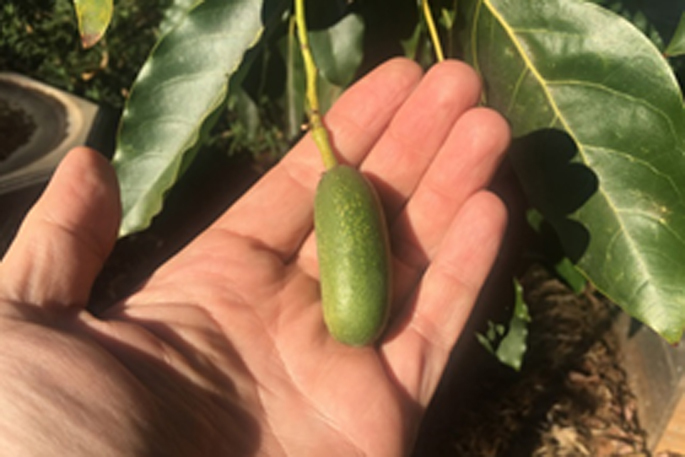 If you’ve looked up into an avocado tree and seen little cucumber-shaped avocados, you have discovered cukes. Cukes – also referred to as cocktail avocados – are seedless avocados that grow in the tree and will hang to full maturity, just like regular pear-shaped avocados. Botanically, there are two main reasons behind the formation of seedless fruit. First is parthenocarpy, where fruit develops without fertilisation such as bananas and some citrus cultivars. Second is stenospermocarpy, where pollination and fertilisation have occurred but the embryo doesn’t form or aborts before the seed is formed – like an avocado cuke. In both cases, the plant must continue sustaining the development of the fruit in the absence of seed formation. Fruit development is controlled by carbohydrates, sugars and phytohormones – such as auxins, gibberellins and cytokinins. In the case of cukes, instead of these resources being supplied by the developing seed, the tree itself or the mesocarp, the fleshy part, of the young fruitlet supplies sufficient hormones for the fruitlet to ‘hold on’ and develop into a seedless fruit instead of falling off, which is what usually occurs. Exactly why cukes form isn’t clear. Surprisingly, there is little research and none very conclusive into the phenomenon of seedless avocados. But most research tends to support the hypothesis that differing levels of carbohydrate reserves are related to the success, failure or partial success – as in the case of cukes – of fruitlet development. Genetics and female sterility are also thought to be a cause – and, in some instances, you may even come across a tree that crops only cukes every year. Some people believe it’s caused by low temperatures, but cukes occur in different regions of the world with very different temperatures over the pollination and fruit set period, which tends to rule that theory out. Certain producers globally have established a market for cukes and ‘cocktail avocados’ can now be found on the shelves of supermarkets and in high-end restaurants. Erica Faber is orchard productivity manager at Just Avocados Ltd.